A few weeks ago during a weekend getaway to Kona, I was able to see KBFD-TV in high definition for the first time on a neighbor island. KBFD can be found statewide in HD on Spectrum cable: Channels 2 and 1002. 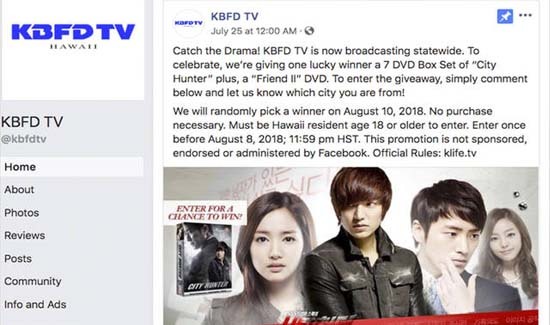 We invite viewers to check out our Facebook page KBFD-TV (facebook.com/kbfdtv) where you’ll find giveaways, detailed information on current dramas and other entertainment information. Right now if you tell us the city you’re in in a comment on our giveaway post, you’ll be entered for a chance to win a Korean drama DVD set with English subtitles.